To start things off, let me say this: Appearances matter. A bank’s interior is responsible for a lot, including giving a first impression to customers, members and visitors. And we all know how important first impressions can be. The overall appearance of a financial institution is a display of your culture, and it can help attract and keep your best employees. All of this is to say that yes, incorporating interior design trends into your bank is important, but is it most important? While a strong aesthetic is important, I’ve found time and time again that functionality is what keeps people coming back to a bank. Whether we are looking at banking today or banking thirty years ago, one thing remains the same – it’s an experience. And when a customer realizes they need to swing by the bank, they’re going to remember their last experience there. Was the flow of the lobby smooth and intuitive or was it confusing and messy? Was it immediately clear where they needed to go to get their needs met? Were they met by welcoming, patient employees or employees who were obviously rushed and overwhelmed? Was the workstation, transaction station, or office they were helped at conducive to efficient customer interaction? All of these elements have a massive impact on the customer experience, and they have little to nothing to do with a bank’s color scheme or furniture choices. Even with an upfront focus on functionality, banks and credit unions can still be on trend. In fact, current financial industry trends promote functionality by focusing on things like layout and industry-specific technology. For starters, a bank’s floor plan should revolve around the intended customer and employee flow of the space, which is heavily influenced by technology choices. There are tried-and-true functionality choices that enable a workflow beyond what owners believe is possible. 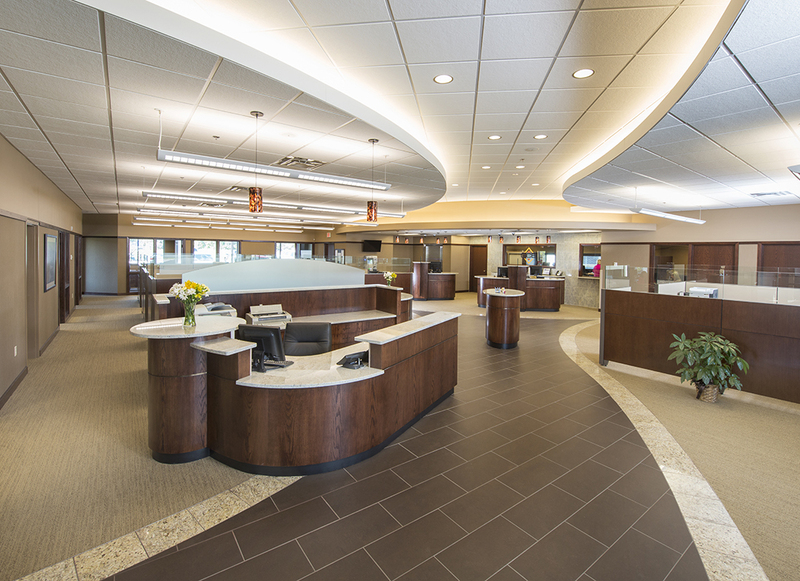 In terms of bank interior design, there is plenty to consider. With the branch’s functionality and floor plan determined, it’s all about finding the right balance of interior design trends to represent your brand and your culture. Design elements like furniture selection, fixture design, artwork, flooring, merchandising displays, video walls, logo walls and branding elements are all important and deserving of thoughtful selection. All these elements combined will fill your space with a stylish, on-trend aesthetic that separates you from your competition with an honest and welcoming representation of your brand and your culture. And while your customers won’t know all the work and intention that went into designing the best operational flow of this space, they will be able to feel it.